I am getting this pop up but unrelated to email. I use a web conferencing website and every time I try to share my screen I get this pop up. Any clue how to make it stop? The title of this article is misleading, Like Amanda, I am getting this pop up unrelated to email. When I select an physical address in Edge, ask Cortana, then click on the map thumbnail in Cortana’s results, I get this message. 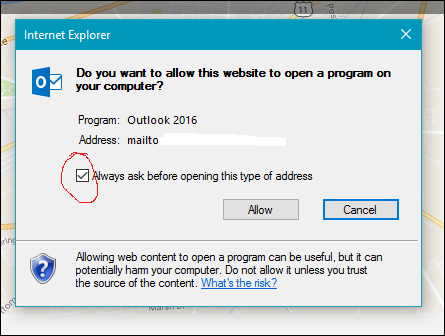 I have no idea what it’s asking me but Yes is the only answer that takes me to the map. I’m a techie and this is confusing. How do non-techies get by in Windows 10 and Microsoft Edge?